With the entire world celebrating Queen Elizabeth II’s birthday, I thought I would share with you this delightful tea, developed by TeaTime magazine. It is truly fit for royalty, whether the queen of England or a special lady in your life. Enjoy! Although the birthday of the British monarch, whoever he or she may be, is traditionally celebrated in June, Queen Elizabeth II was actually born on April 21, 1926. Join us as we celebrate Her Majesty’s 90th birthday with an elegant British tea fit for a queen. In the British fashion, the scones are the second course. 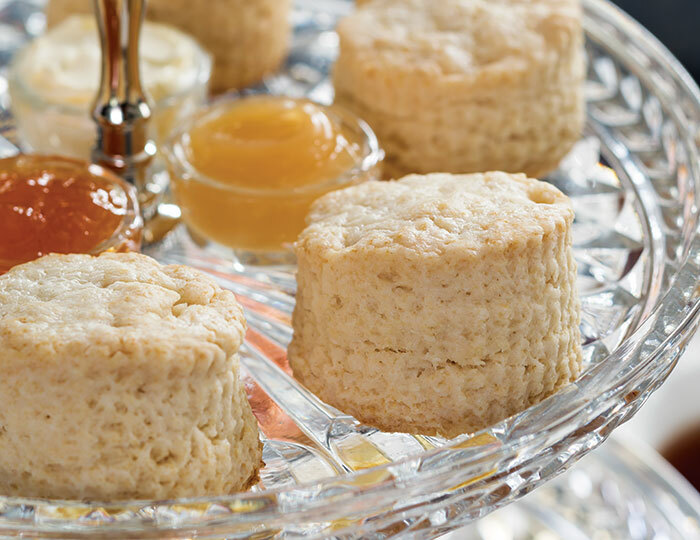 These Cream Scones would be delightful with lemon curd, clotted cream, and jam, and a pot of Royal Wedding Tea from Capital Teas. 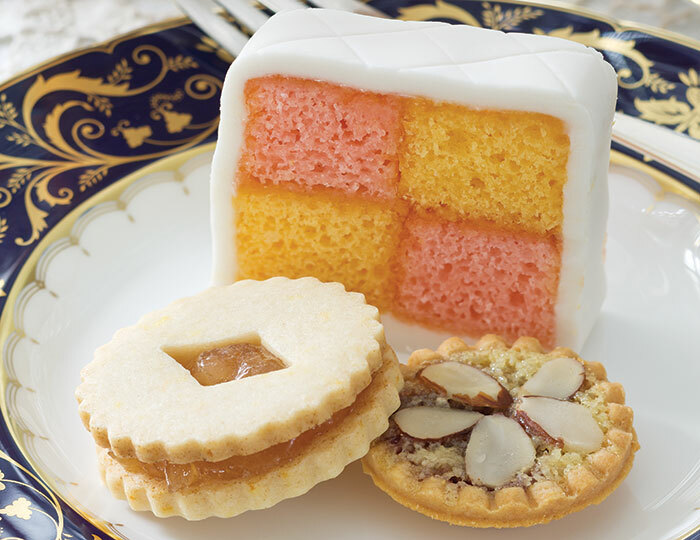 Delightful and old-fashioned desserts, such as Strawberry-Lemon Battenberg Cake, Lemon Linzer Cookies with Ginger Preserves, and Mini Cherry Bakewell Tartlets, are the perfect finish to our Fit for a Queen Tea. Capital Teas’ Darjeeling Margaret’s Hope 2nd Flush is the perfect tea pairing. Have you ever hosted an afternoon tea? Love all these stories. I am inspired to host a tea! Wonderful article and equally important replies.Thank you for sharing! I’m a little late posting, but had to share 6 year’s ago my daughter’s teacher 5th grade choose to have a weekly tea, in the class room the children enjoyed that. For Christmas time, my daughter asked her teacher if we could make scones and have strawberry and raspberry jam, to go with their tea, she said yes after asking parent’s whom all said yes. I brought 6 trays of scones, yes I started at 7 am to bake up until10:30, they had tea at 11:00 in the morning. I brought along some tea dishes that were my husband’s great grandmother, from Denmark when they came over in 1925. The whole class thought this was so neat and who knows how many of the children, take tea today I hope many of them still do. Lidy, thank you for sharing your memories of your grandmother. I know she was a special lady. Just a few years ago, my husband and I visited the Victoria and Albert Museum in London . After a few minutes, we realized we would not be able to view everything . My husband had the idea of hiring a private guide for a few hours. It was a great idea ! She was a friendly lady and she amazed us with her knowledge. After a wonderful afternoon ,we invited the lady to have tea with us at the museum`s restaurant. It was a memorable experience. She took charge of every little detail: little sandwiches, cakes and tea . What a remarkable woman. I love that museum. The needlework collection is spectacular. Sounds like you had a great day there. Yet another delightful blog!!! I love my Tea Time magazine!! I too, wait to hear from you and “our” friends through your wonderful “ribbons”! I’ve written before of my darling “tea time” with granddaughters Amelia and Evelyn. They are now 10 and 8, but love going through my scarf and hat collections and “dressing” for tea with Yaya!! And “Yaya” loves every minute!! When I worked, I had an electric tea pot in my office and at 3 it was filled with water and everyone was welcome to pour water and add the tea of their choice. Definitely not a formal tea…. But both fun, relaxing and memorable. Isn’t that truly what it’s all about? 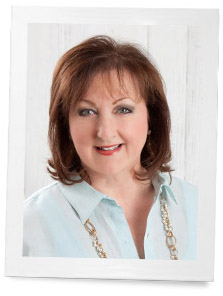 Whether entertaining friends with tea and scones (I loved high tea in England…. And tea time In Ireland…) or memories of little girls with Yaya’s hats, scarves and gloves….or a friendly tea break at work….or just a cup my myself reading Tea Time or this blog… All are just wonderful!! Thanks as always to alll for sharing your tea experiences and life!! Tea is always wonderful. It is amazing to me how when we have tea we stop and linger. Whether formal or casual it is a wonderful time. Thank you for sharing. My friend, Clara and I host afternoon tea parties for our friends every 6 weeks or so. We both subscribe to Tea time magazine and savor the time spent looking through the pages creating the menu for our next one. My new favorite recipe is the dried apricot scones in Tea Pleasures! What a pleasure to share the love of tea with my dearest friend! Oh my goodness those scones are delicious. I loved dried apricots in scones. In our test kitchens, the ladies are constantly developing new scone recipes…..scones are my favorites for tea! My three friends and I are all quilters and the “Tea Ladies”. We each take a turn having a tea at our homes each year. So far, we’ve had Valentine’s, Easter, Patriotic, Christmas and an Apron Tea. The Apron Tea was at my house and everyone wore their favorite apron and June Cleaver pearls. I decorated with vintage aprons, an old wooden ironing board, old laundry items like irons, and the favors were Coke bottles with little aprons on them. Remember those? Next time I’m having a Farewell to Downton Abbey Tea. I’ll use the Royal Doulton English Renaissance china my mother bought when we lived in England in the 60’s. Today was my 65th birthday and my husband and I went to afternoon tea at the Adolphus Hotel in downtown Dallas. It was a beautiful setting in the hotel lobby with a pianist playing a grand piano. And the food was beautifully prepared and delicious. We really enjoyed ourselves! Having tea in a beautiful setting or just by myself at home is always a special treat! Susan, what a perfect way to celebrate your birthday! Happy Birthday! Your tea celebrations sound fabulous. I think Downton Abbey made many people try tea that perhaps wouldn’t have done so. I know I would love to be with the Dowager at tea time!! My sister and I used to call each other to discuss the latest Tea Time magazine. We finally decided to stop talking about it and have a tea, using recipes from the current magazine. Every other month, we would invite different friends to join us for tea, at one of our homes. Since then, we’ve hosted birthday tea parties for our mother and for granddaughters. I’m sure the Queen would be appalled, but we sure have had a good time! TeaTime magazine continues to delight tea lovers. Lorna Reeves and her staff have so much fun discovering new teas and recipes. I have never hosted a tea, but your lovely photo brought back a sweet memory of afternoon tea at the Empress Hotel in Victoria, BC. My special auntie and I took a trip to Victoria together and treated my sons to afternoon tea at the Empress. It was a delight for the senses and a truly special occasion. Thank you for the inspiring post and thoughtful reminder that any day is a lovely occasion for tea! I remember my first visit to the Empress. That is a tea experience I will always remember. Thank you for sharing your memories with us. I love the cobalt blue and gold china! ‘Tis so elegant and regal and absolutely gorgeous! I do believe Her Majesty would approve. 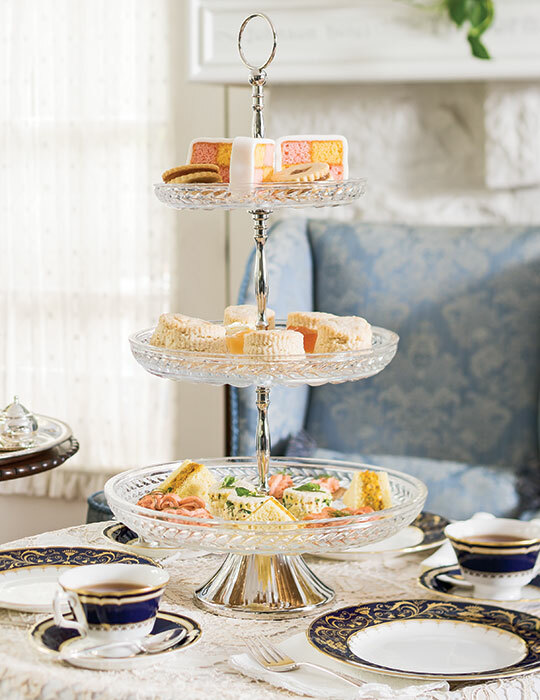 My family has hosted many an afternoon tea for various occasions such as Valentine’s Day, St. Patrick’s Day, and, our biggest blow out, the Kentucky Derby. I would love to be at the Derby Tea! I love the hats! you truly have fun with your tea parties. Thank you. I absolutely love the whole idea of a “proper English tea”. It is so refined and elegant and so necessary in a society lacking in grace and civility. Margaret you and I share the same sentiments. Thank you. Too many years ago, I was a teacher in the middle of nowhere in Kenya. Actually, I was on the border between the coffee-growing region and the tea-growing region. Anyway, being a former British colony, Kenya adhered to tea time. We had only white bread with margarine–no fancy cakes–but with the milky, smoky tea, it tasted great. A very fond memory. That’s so wonderful. Thank you. The comments that everyone writes are almost as good as the article. Such a lovely community! I always love reading these refreshing postings in my email. I had to sit down with my cup of tea to read and savor the moment. My grandmother was born in Wales then London and I recall her always having tea no matter the time of day. I have her tea cups that are lovely to look at ( but sadly my tea gets cold to quickly when I use!) My mother and I follow in her tradition of several cups throughout the day. On the hottest of Florida days there is nothing like coming in from gardening to a nice cup of hot tea. That is a true tea lover! Soothing, calming and lovely. Nothing better. For my 40th I threw a ” celebration of friendship ” tea and honored the friends in my life while sharing with only a few that it was a big birthday. Th tea was held to honor them and it was perfect. I have two young daughters and give them tea before school. Caffeine free roobios, green or pomegranate white tea. Great for their health as well as carrying on a tradition that I want to never cease, the love of all things English. What beautiful thoughts. Thank you for sharing with us. I do love those tea companies that you mentioned. My favorite is Earl Grey and I love to try each company’s blend. Beautiful display for a lovely tea. I have done so many teas and they are always a big hit. Always serve champagne too. -One that was different was the tea I did for my son’s class and his teacher’s baby shower. It was such fun and the kid’s had a great time choosing all their different little treats. Even the boys enjoyed it. I served tea or punch and decorated over the top. Everyone loves a beautiful tea. – Never miss tea time on a Cruise either. Peggy that you for sharing with us. I think it so fitting that you chose to celebrate Queen Elizabeth II by sharing the lovely tradition for which they are so famous. She is a refined and respected leader. I love the picture most with her grandchildren. My mother worked but on every Sunday afternoon around 3 PM she served up lemonade and small sandwiches or crackers. I really looked forward to it but as a child this ritual sorta came and went until I was older. Now the memory of that time is so special. I took my daughter at a very young age to the Ritz Carlton in Atlanta where they celebrated in high fashion. She learned how to hold the cup and what scones are-something I wanted her to experience. Another happy memory! Today around 3 PM my husband and I enjoy hot tea or flavoured coffee together. We usually have a shared treat. It is a pause in the day that is so pleasurable and relaxing. Aren’t we grateful for the rituals and celebrations we have that enhance our lives in so many ways. Yes yes yes my friend would say. The “Run for the Roses” is coming soon. I have the most beautiful hand painted pillow of a horse adorned with the roses in my small setting room. Another event with pomp and circumstance! Tea brings friends and family together for such memorable moments. Thank you for sharing with us. In recent years the teas I have hosted have been, by necessity, for only one special lady at a time. The most recent was for a new neighbor who had lived in this country for her whole adult life but was born in England. Upon moving to a garden home a few doors down from mine she completely transformed her gardens into flowery English style. My tea service was hand painted by the late Billie Goodall with dainty gold rimmed and gold handled cups and saucers with varied acorn and oak leaf designs in Autumn shades of green, yellow, rusty orange and brown. Each cup is unique and has a painted leaf inside the cup somewhere and my name and the artist’s name on the bottom. The set of six has extras in case of any accident. The tea pot has a golden spout and handle. My choice of tea is usually a Ceylon Oolong by Harney and Sons whose teas I first tasted at the Hotel Ritz in New York during the Christmas Season. I serve a choice of sheer lemon slices or milk with sugar lumps. 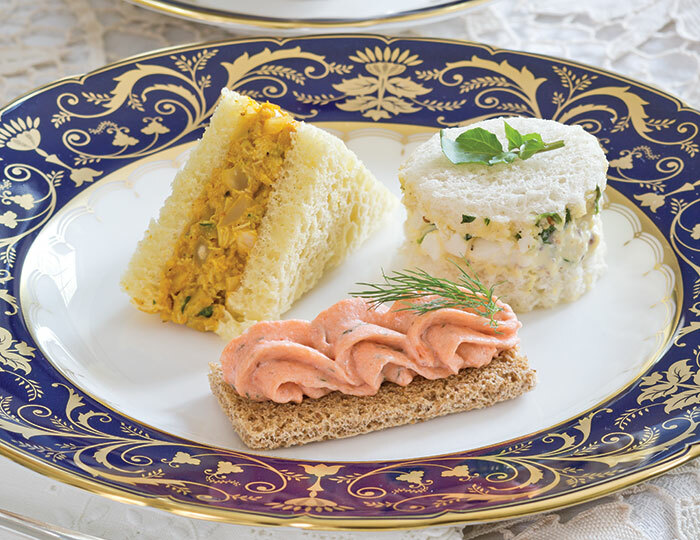 My dainties are tiny sandwiches of cream cheese and olives, chicken salad, a bit of egg salad with white pepper and little cakes or biscuits, as the English say. Little fagotted, thin, linen napkins complete the service upon a large tray which has life – sized magnolias and their leaves painted on it. My teaspoons are plain silver, four o’clock tea spoons I purchased in County Wicklow, Ireland. If they are available, fresh or blooming potted flowers or attractive leaves lend color and life to the room. These little tea times are cozy and give me a chance to concentrate on celebrating one dear lady and getting to know her better, or renewing an old friendship after a long period of separation. Of course, I appreciate seeing the grander versions of teas pictured, but different times of life and circumstances need not prevent our enjoying a tea party of our own imagining. Thank you, Phyllis, for always stimulating our imagination by demonstrating elegant approaches to so many aspects of our lives. Betsy, your tea service sounds enchanting. Tea parties are magical to me. One of the first teas I had the pleasure of attending was at the Ritz in Atlanta and you are right, their Oolong tea is amazing. Thank you for sharing your lovely thoughts. I absolutely love the idea of tea breaks in the afternoon. Whether just by myself with a little treat or with friends, it always feels special. The above tea looks amazing. Can’t wait to try some of the recipes.I have a trip planned to Edinburgh this year and can’t wait to attend an afternoon tea. But I also enjoy a morning tea break called “elevenses”(starts at 11 am. )and this is something of a tradition in Scotland. Warm the teapot with water, when warmed empty water. Add tea leaves , pour on boiling water. Milk into the cup first followed by the tea, sugar if desired. Perfect cup of tea served of course in a bone china tea cup and saucer! Don’t forget the spoon! Thank you for sharing your brewing techniques. I would love to know if you have a favorite scone recipe from Britain. What a beautiful tea. Royalty or not, tea is the perfect way to celebrate with family and friends. The cake looks beautiful, this would be perfect for Mother’s Day. Aside from my traditional Christmas Day tea, I have celebrated my own birthday many times by hosting a special tea for all my girlfriends. My European grandmother always served tea every day at precisely 3:30, as a grace note in the day. I try to do this here in the US using her silver teapot.